Equipped with a moving base that allows for both side to side and gentle back and forth motion, this all-weather wicker swivel glider offers truly impressive outdoor resilience without sacrificing comfort. Notable for its curved arms and premium cushioning, this lounge chair also possesses a fully-welded aluminum frame, plus wicker strands reinforced with aluminum wire for added strength. 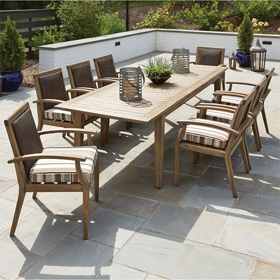 Featuring a flawless 2x2 weave pattern with rope detailing, signature diamond-shaped base design and decorative back buttons, the chair achieves a transitional aesthetic sure to compliment both contemporary and traditional outdoor spaces. This glider is part of Lloyd Flanders' longest running collection, Reflections, which has been a customer favorite for over 25 years.